Abuja, 5th July 2018. The United Nations Office on Drugs and Crime (UNODC) is seeking greater collaboration with ECOWAS on the renewed efforts to curb drugs and substance abuse as well as trans-national crimes in the region. The UNODC Regional Representative Mr. Pierre Lalaque made this known in Abuja, Nigeria on the 4th of July 2018 while conferring with the Vice President of the ECOWAS Commission Mrs Finda Koroma. 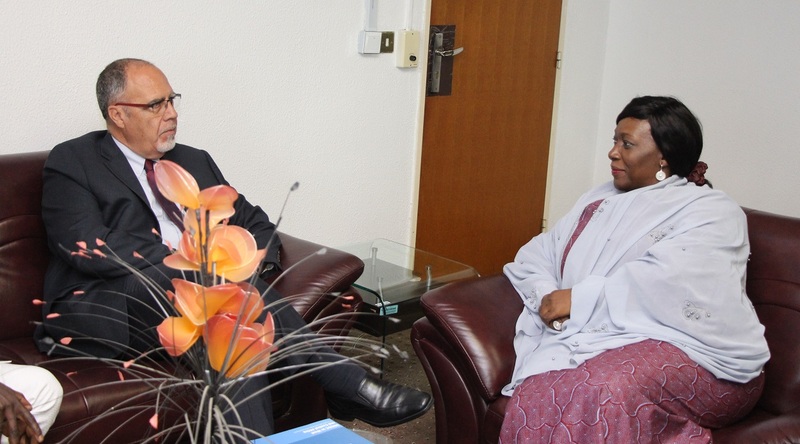 The UNODC chief who fielded relevant inquiries from Mrs Koroma, said it is imperative to discuss UNODC’s work and achievements in the region with partners while taking a deeper look at future areas of collaboration between the UNODC and ECOWAS. He said in working with ECOWAS and members of the Sahel Group of Five nations (G5), a lot of interventions are needed in the areas of drug use, piracy, human and armed trafficking as well as irregular migration. Disclosing that the UNODC is also working with ECOWAS to create a reliable data base on drugs in the region, Mr. Lalaque noted the need to leverage on the joint projects stemming from the Praia Declaration as it concerns the supply of and demand for drugs. In a free flowing interaction with his host, Mr. Lalaque who was flanked by the UNODC’s regional coordinator Cheikh Toure and his counterpart in charge of ECOWAS support project Mr. Jullien Woirin, expressed the desire for the development of an ECOWAS curriculum for the treatment and prevention of drug abuse. In this regard, he drew attention to the UNODC’s flagship programme (N-Plug) which focusses on school surveys while touching on the several programmes initiated by his Office. Responding, Vice President Koroma noted that all of the issues put on the table are being taken up at the highest level. She stressed that ECOWAS will like to prevent and then reintegrate reformed victims of drug abuse back into the society. Raising the issues of drug abuse prevention, criminal justice system, as well as legal reforms as critical things to look at in an enduring partnership, Mrs. Koroma harped on the need to tackle existing stereotypes while reversing the trend whereby girls in the region are now getting more addicted to drugs. 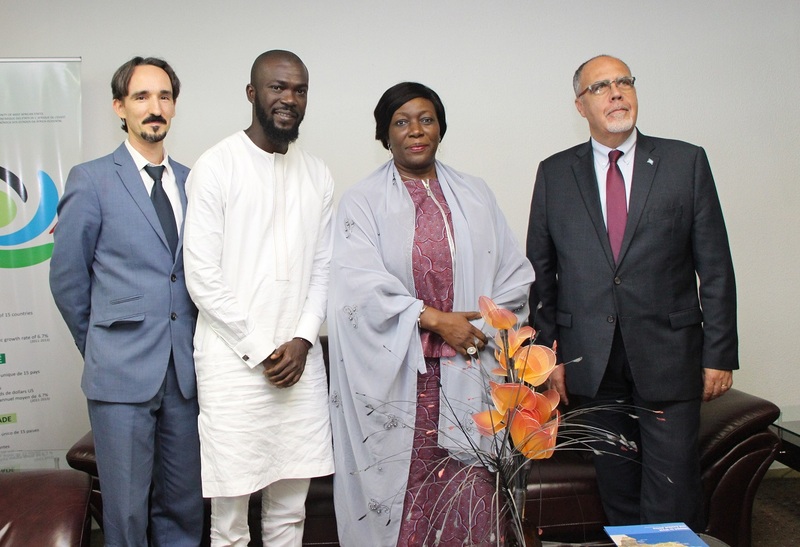 Urging the UNODC team to “Keep up the good work” she noted that the documents already signed between the ECOWAS Commission and the UNODC will come handy in the desire to pay attention to results while ensuring that the desired impact is made. 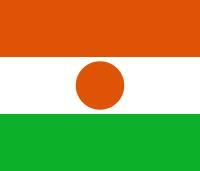 Importantly, Vice President Koroma stressed that ECOWAS has an open policy on the matter. She pointed to the clear need for Central and West Africa to dialogue on the common issue, seeing that the only way to sustain the lasting beneficial relationship that currently exists is for the administrative machineries of both regions to be on top of things.